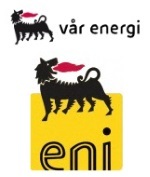 édité le 19/03/2019 - Plus de news de "ENI" - Voir la fiche entreprise de "ENI"
Eni through Vår Energi, jointly owned by Eni (69.6%) and by HitecVision (30,4%) announces an oil and gas discovery in production licence 869 in the North Sea by drilling the exploration well 24/9-14S and a horizontal appraisal well 24/9-14A in the Froskelår Main prospect. Vår Energi AS holds a 20% stake in the licence, while Aker BP ASA (which is the Operator) holds 60% and Lundin Norway AS 20%. The wells are located about 4 km northwest of the Bøyla Field and 225 km west of Stavanger in a water depth of 120 m and were drilled with the semisubmersible drilling rig Scarabeo 8. Exploration well 24/9-14S was drilled to a vertical depth of 2097 m below sea level, and reached TD in the Paleocene Sele Formation. The main bore proved a hydrocarbon column of 68m with and an oil zone of 38m. It encountered several oil and gas prone sandstone layers that are interpreted as injectites within the Hordaland Group, with very good to excellent reservoir properties. The horizontal geological side-track 24/9-14A verified the oil-water contact and reached a respective vertical and measured depth of 1847 m and 4432 m. It encountered an interval of total 540 m with reservoir sandstones of good quality and variable thickness. Extensive data acquisition and sampling have been carried out. The wells are permanent plugged and abandoned. Preliminary estimates place the size of the discovery between 63 and 132 Mbbl recoverable oil equivalent. A part of the discovery could straddle over to the UK side. The discovery could be linked to nearby existing infrastructure in the Alvheim area. PL 869 was awarded in APA 2016 – Awards in Pre-Defined Areas – and surrounds the PL 340 (Vår Energi 20%) which contains the Bøyla Field and the 2018 discovery Frosk. Froskelår Main results doubles the resources of the Frosk discovery and is strategically important for Vår Energi in the area around the Bøyla Field and the Vår Energi operated Balder/Ringhorne Field. Vår Energi is a new leading, independent E&P company on the Norwegian continental shelf (NCS) and is a result of a merge between Point Resources AS and Eni Norge AS late 2018. Vår Energi is owned by the Italian energy company Eni (69.6%) and the leading Norwegian investor company HitecVision (30.4%). Vår Energi has ownership in more than 100 licenses and operates oil and gas production over the whole Norwegian continental shelf; the Goliat field in the Barents Sea, the Marulk field in the Norwegian Sea and the Balder, Jotun and Ringhorne fields in the North Sea. The company has an organization with 800 employees with more than 50 years’ experience on the Norwegian continental shelf, built on the previous companies’ heritage offshore Norway. Vår Energi’s current production stands at approximately 160,000 boe per day.